Clarendon Press. Hardcover. 0198144776 Book appears unread in a like dust jacket. Top Quality Seller - Customer Service available. . Fine. Oxford University Press. Very Good+ in Very Good dust jacket. 1993. Hardcover. 0198144776 . Light Foxing to top of textblock. Some foxing and minor creasing to DJ. 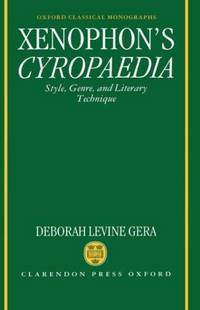 ; Oxford Classical Monographs; 1.2 x 8.6 x 5.6 Inches; 368 pages; A study of the "Cyropaedia", an historical novel by the Greek writer Xenophon, based on the life of the Persian King Cyrus the Great. This book looks at the various genres in the work and combines discussion of Xenophon's predecessors and contemporaries-- in particular Herodotus, Plato and Ctesias -- with a commentary on selected passages. .
Oxford University Press, USA, 1993-07-29. Hardcover. Good. Oxford: Oxford University Press, 1993. 2nd Printing. Hardcover. 348p. A hardcover book in near-fine condition with a dustjacket in fine condition. The book is clean and tight except for a stamp on the front free endpaper. The jacket is pristine. From OXFORD CLASSICAL MONOGRAPHS. 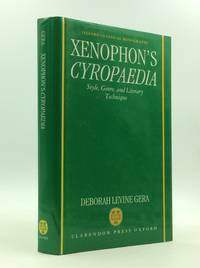 A study and commentary on Xenophon's CYROPAEDIA (an account of Cyrus the Great). Clarendon Press. Hardcover. 0198144776 Brand New ,Original Book , Direct from Source , Express 5-8 Business days worldwide Delivery. . New. Oxford University Press, USA, 1993-07-29. Hardcover. Used:Good. Clarendon Press. Hardcover. 0198144776 Special order direct from the distributor . New. 1993-07-29. Good. Ships with Tracking Number! INTERNATIONAL WORLDWIDE Shipping available. May not contain Access Codes or Supplements. May be ex-library. Shipping & Handling by region. Buy with confidence, excellent customer service!